The decking timbers used by Outside Concepts fall into two main categories – hardwood and softwood. Hardwood timbers are a popular choice for decking and there are a number of excellent choices currently on the market. Hardwoods are stable and durable and take well to staining and oiling which enhances their natural sheen and colour. The long straight grain features minimal knots and high density ratings means that hardwood timbers gives consistent colour and finish to your Outside Concepts deck. Many of the rainforest timbers like Kapur and Merbau, known as Scrub Mahogany or Kwila are excellent for decking use being easier to cut, fit and fix than other hardwoods. Merbau is one of seven species of timber awarded relatively high fire-ratings, which means it can be used in most fire prone areas up to BAL 29. 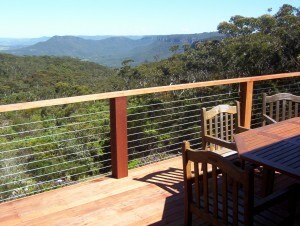 This makes it a popular choice in areas like the Blue Mountains in NSW. 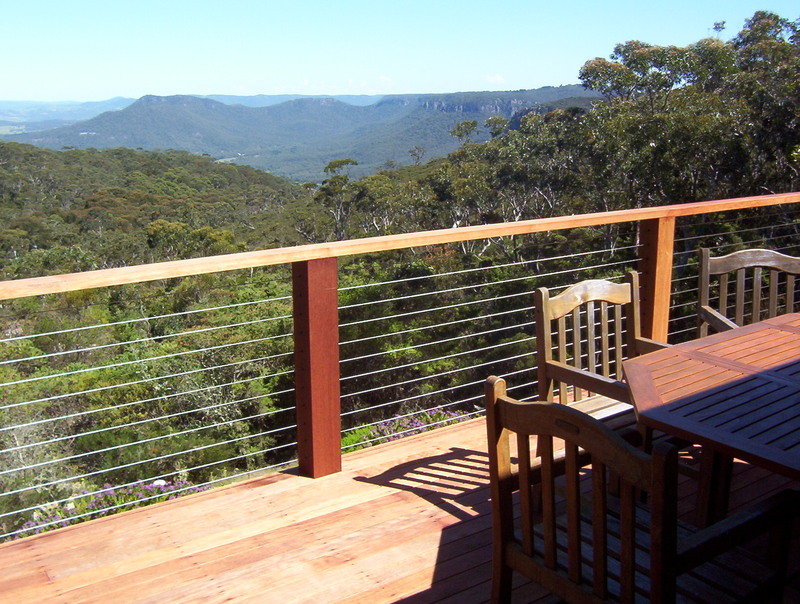 Merbau is readily available in long lengths, which is an important design consideration when spanning long stretches of deck. If you prefer to use an Australian hardwood there are also very good options available. Jarrah is a strong choice especially in South Australia and Western Australia but is widely available throughout most of Australia. Blackbutt, Spotted Gum, Northern Box and Swan River Red, known as Kauri are also used widely. If you want to keep the cost down, you can opt for a mixed hardwood deck, which is usually a mix of what is available locally in your state. In many situations treated pine decking is preferred. It is cheaper and easier to cut and fix being a softwood timber and in Australia it is plantation grown. Its popularity is deserved especially when well-maintained and protected by one of the opaque and semi-opaque decking finishes. Roofing the deck will significantly increase the life of your deck in terms of durability and appearance and will reduce the need for re-staining and oiling. When using treated pine as the specified framing timber consider having the decking boards screwed down rather than gun-nailed for improved performance. This prevents the nails from lifting as treated pine shrinks slightly with age. The National Association of Forest Industries categorises timber in a number of ways. They use Density, Toughness, Durability and Colour ratings to specify timber for various uses and applications. Generally hardwood should have a hardness rating of between 750 and 1100 for optimum use in decks. Bear in mind, the denser the timber the harder it is to work with, so nailing or screwing down of boards and achieving a premium finish may take a little longer than when using a softwood timber such as treated pine. For detailed information about individual timber species go to the Australian Wood Solutions website (WoodSolutions is resourced by Forest & Wood Products Australia Ltd (FWPA), a not for profit company that provides national research and development and promotional services to the Australian forest and wood products industry) or contact your Outside Concepts representative to discuss the best solution for your house and budget.